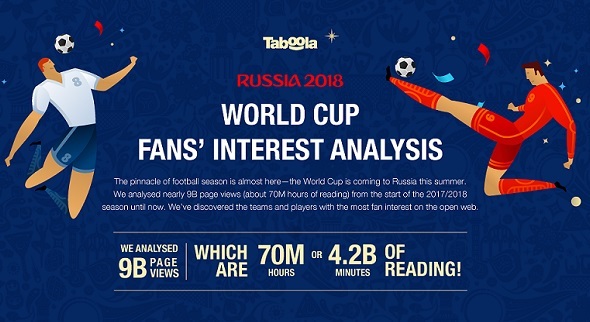 Taboola has analysed nearly 9B page views (the equivalent to nearly 70M hours of reading) from the start of the 2017/2018 season until now. The findings show the teams and players with most fan interest on the open web. Readers most anticipated games are Group B - Spain vs. Portugal and Sweden vs. Germany. If page views were equal to matches won, readers determined that Brazil (75 % of page views) dominated group E, while Mexico (41% of page views) rose to the top of Group F over Germany. If you could build a dream team based on reader interest, there is no debate that Cristiano Ronaldo (Portugal) is the most interesting player in the world, with almost 3x the number of page views of Lionel Messi (Argentina). The world cup winner based on page views is Argentina, with Colombia reaching the quarterfinals and Mexico making it to the semis. While there may be no surprise that Brazil dominates Group E with 75% of page views, Mexico has beaten Germany to top place in Group F with 41% of page views. And despite a sensational season for Mohamed Salah, Egypt would be going home early with just 8% of Group A page views.